Benchmarked: The Galaxy S6 is the fastest Android phone. Period. Benchmarks scores are nothing but numbers. The real measure of a phone’s performance is how well it runs popular software, and how that performance holds up over time. That’s what we care most about. 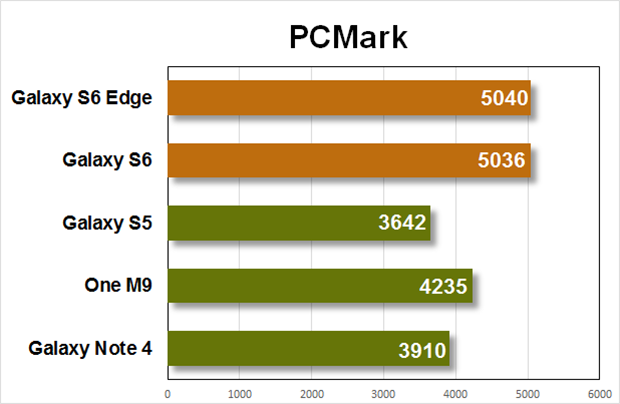 Still, we thought we would take a closer look at the performance of the Galaxy S6 and Galaxy S6 Edge, including industry standard benchmarks. This is the first time Samsung’s bundled its own Exynos chip inside the U.S. variant of its flagship smartphone. That’s a big deal, especially with all the unfortunate—if not slightly exaggerated—press surrounding Qualcomm’s Snapdragon 810. We want to see how Samsung’s new phones perform against some of its competitors, and last year’s Galaxy S5 flagship phone. The results show that these are, hands down, two of the most powerful phones you can buy. The first Exynos of its kind—in the U.S.
You can call the Galaxy S6 Edge a powerhouse. Samsung’s new flagships are powered by the 64-bit Exynos 7 Octa 7420 processor and 3GB of LPDDR4 RAM. The chip consists of four 2.1GHz Cortex-A57 cores and four 1.5GHZ Cortex-A53 cores—the way Samsung explains it, four are devoted to delivering top performance, while the other four are aimed at battery efficiency. The Galaxy S6’s 14nm chip (the first 14nm chip in a phone) has been optimized to dramatically reduce its power consumption, boosting battery life. 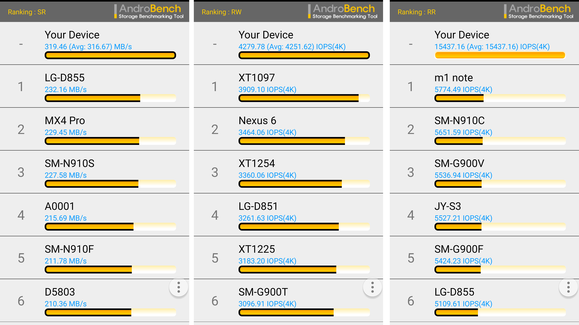 Samsung’s Exynos processor beat out the recently launched LG G Flex 2 and HTC One M9—both powered by Qualcomm’s Snapdragon 810—in every performance benchmark we threw at it; including AnTuTu, Vellamo, Geekbench, and PCMark. 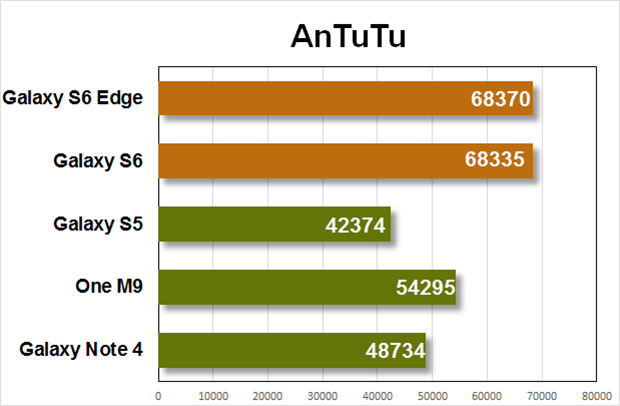 AnTuTu tests overall device performance, including user experience, which the Galaxy S6 and Galaxy S6 Edge apparently deliver on. Notice the jump from last year’s Galaxy S5 to this year’s flagships. 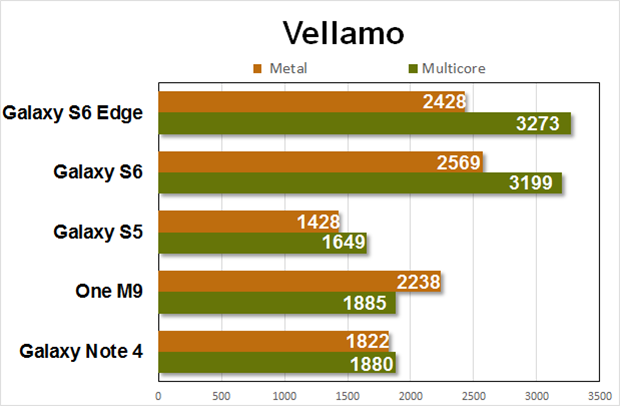 The Vellamo benchmarks test CPU performance. 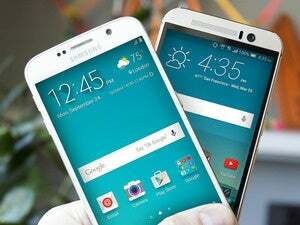 The Galaxy S6 and Galaxy S6 Edge far beat out the One M9. PCMark tests the device as a whole, based on everyday activities like photo editing and video playback. It’s hard to ignore the numbers. 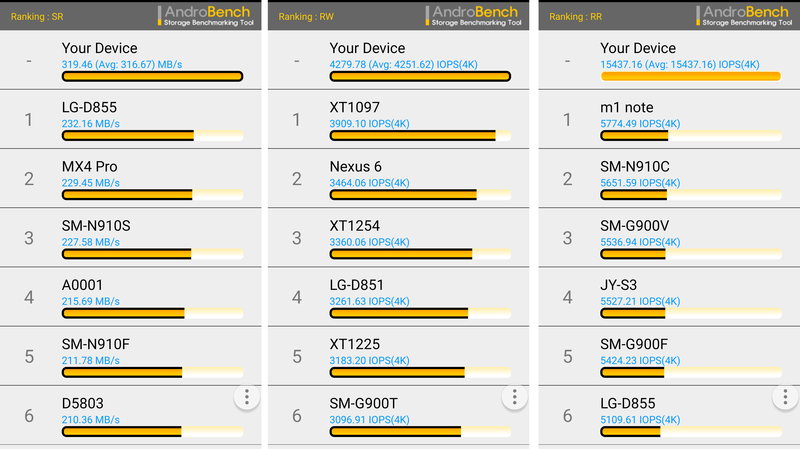 Samsung’s Exynos processor outperformed the competition across the board, scoring exceptionally high in both PCMark and AnTuTu. With TouchWiz lighter than it’s ever been, our experience using the phones mirrors these benchmark results—they’re incredibly fast and responsive. Early Exynos processors weren’t exactly graphics powerhouses, the Galaxy S6 delivers really excellent 3D graphics performance thanks to the Mali-T760 MP8 GPU. The GPU runs up to 772MHz, and together with all the memory bandwidth from that LPDDR4 memory, Samsung’s chip is no slouch in the gaming department. 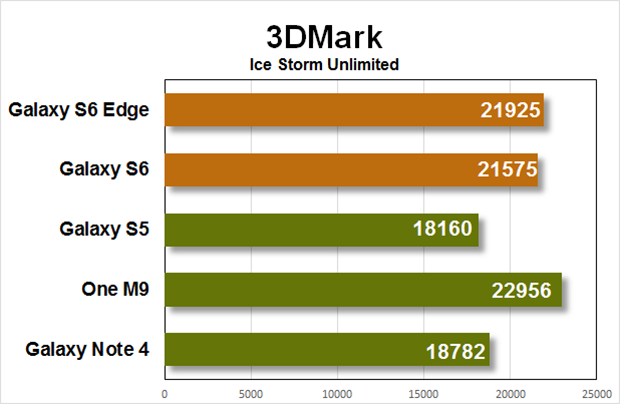 The Galaxy S6 and Galaxy S6 Edge performed well in 3Dmark, though this was one area that the One M9’s Snapdragon 810 succeeded. I can conclude that the Galaxy S6 and Galaxy S6 Edge are phones made for high-powered gaming. You’ll like gaming on the Galaxy S6 and Galaxy S6 Edge, though the latter might end up being a weird experience because of its curved edges. Regardless, you’ll be able to move in and out of applications and quickly fire up games when you’ve only got a few minutes to spare without experiencing any hassle. No one wants a phone that can’t make it through the whole day without a charge. The Galaxy S6 and Galaxy S6 Edge come equipped with a 2550 mAh and 2600 mAh battery pack, respectively. That’s a bit of a downgrade from the Galaxy S5’s 2800 mAh battery. I was particularly impressed by how little I had to charge each phone in the week that I used them. My experience with the last few Samsung devices was that after the honeymoon period was over—essentially, a few months after I’d posted the review—they turned into these nasty little battery suckers. I feel optimistic that’s not the case this time around, especially since that wasn’t the case with the Galaxy Note 4. It’s still one of the most battery efficient phablets on the market and I’d like to think whatever tweaking Samsung did there, it also did it to the Galaxy S6. 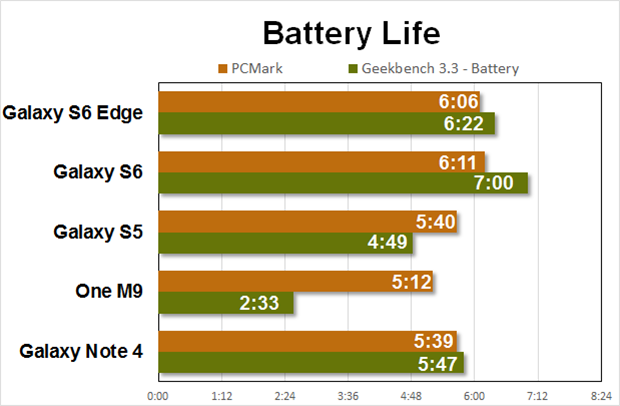 The Galaxy S6 and S6 Edge top our flagship battery benchmarks, though they don't last as long as big-battery behemoths like the Droid Turbo. With the display calibrated to 200 cd/m2, Samsung’s new phones outlast many of its rivals. They’re not going to last longer than low-end phones with small displays and weaker processors like the Moto E, nor bigger, thicker phones with massive battery packs like the Droid Turbo. But compared to other thin, light, high-end premium flagship phones, the Galaxy S6 and S6 Edge avail themselves well. On standby, with their displays off, both phones seemed to hibernate. It took over three days of on-and-off usage to kill the Galaxy S6, while the Galaxy S6 Edge stayed quiet on top of my dresser over the weekend. That device only drained 20 percent of its battery power when I went to check on it two nights later. Heed warning that both phones do eat through a lot of energy with the brightness turned up—their bright Super AMOLED displays are battery hogs. On the drive in to work, the Galaxy S6 Edge burned through 20 percent of its battery life powering Google Maps’ turn-by-turn directions, though I had left the screen on at mid-brightness and allowed notifications to push through all at the same time. Afterwards, I turned off turn-by-turn directions and the GS6 Edge’s screen, and it stayed at 79 percent for a good portion of the morning. That’s true battery efficiency: when you can use the hell out of your phone for about an hour, and then not worry that will prevent you from using it the rest of the day. If the phone does die on you in the middle of the day, you can rest assured that it'll charge up in no time flat. The Galaxy S6 charged from 20 percent to 54 percent in just 20 minutes, from 0 percent to 86 percent in 50 minutes, and from 0 percent to 100 percent in an hour and 18 minutes. The "Oh crap my battery is low, I wonder how much I can charge it in 15 minutes before I board the plane" scenario looks great for this phone. Remember when you switched your computer from regular ol’ mechanical hard drives to solid state drives? Well, the performance improvement of the Galaxy S6's storage isn't quite that dramatic, but it's still really flippin' fast. 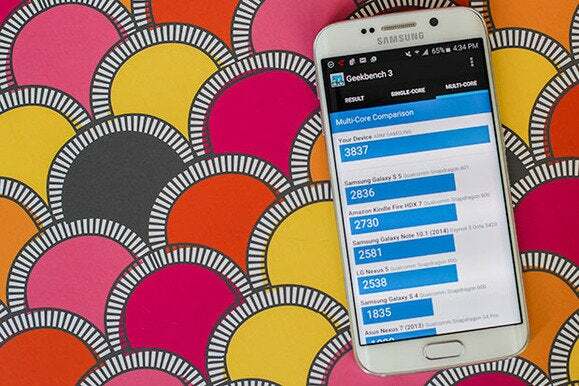 The Galaxy S6’s storage performance in AndroBench. Far left is sequential read. Middle is Random Write. Far right is Random Read. Samsung's new flagship phones are the first to ship using the new Universal Flash Storage (UFS) 2.0 standard, which offers higher read and write speeds and increases reliability in flash memory storage. That means shorter loading times on big apps, faster application switching, and less lag when saving those hi-res burst photos. UFS 2.0 is also supposed to be more energy-efficient, which may contribute to the GS6's ability to squeeze good battery life out of a somewhat smallish battery pack. We'll see UFS 2.0 in more phones over the coming year, but Samsung's the first to bring it to the mass market. TouchWiz has its moments on the Galaxy S6. It’s gotten a lot better since the Galaxy S5. TouchWiz has not only changed aesthetically, but it’s less of a memory hog, too—or at least it feels like it. It definitely feels faster than it did on its predecessors, though Android 5.0 has a lot to do with that, too. TouchWiz also has a new Theming engine, which I figured would eat away at battery efficiency, but it just ended up making everything look real cute. I’m also happy to report that there’s nary a delay when I slide down Notifications Shade. I’m looking forward to revisiting these performance benchmarks in about six months time—you don’t see a phone’s true abilities until after they’ve been used and abused for a while. Samsung’s new flagship may be a powerhouse now, but it could be a different story a later on. For now, if you’re absolutely looking to adopt the most powerful phone in the US market, you may want to really consider the Samsung Galaxy S6. 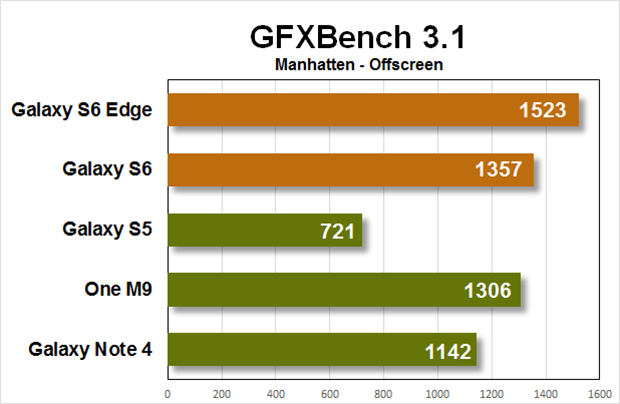 This story, "Benchmarked: The Galaxy S6 is the fastest Android phone. Period." was originally published by Greenbot.